10% of the proceeds from the Reclaiming the G*ddess Series will go to CARE, a leading humanitarian organization fighting global poverty. Women are at the heart of CARE's efforts to improve basic education, prevent the spread of HIV, increase access to clean water and sanitation, expand economic opportunity and protect natural resources. 10% of the proceeds from the abstract portfolio will go to Let Art Talk, a grass roots organization helping the children and people of Uganda by empowering communities through art. 10% of the proceeds from the landscape portfolio will go to The Jane Goodall Institute to benefit Roots & Shoots, whose mission is to foster respect and compassion for all living things, to promote understanding of all cultures and beliefs and to inspire each individual to take action to make the world a better place for people, animals and the environment. Nicole Cutts is an artist, teacher, healer and writer. Her artwork is a testament to her love of the spiritual, the sacred, and nature. She has a fierce desire to capture and preserve the magic and beauty that she sees in the natural and spiritual world. She is currently working on a series that represents her quest for images of female divinities. Entitled “Reclaiming the Goddess,” these brightly colored mixed media pieces offer visual representations of the sacred female across a myriad of cultures and from the collective unconscious. Nicole was moved to create these pieces to represent her personal and spiritual search for divine images that reflect who women really are. She had grown tired of the limited religious images offered to us in this Judeo/Christian/Muslim society so she went on an archeological dig of sorts finding that across all times and all cultures there have been real positive and powerful images of female deities. Nicole’s previous abstract series, "Gemini Visions" was spawned from inspiration received in a dream. These works are studies of color and design, combining Adinkra symbols from Ghana, Chinese kanjis, and natural elements, with a palette of deep reds, oranges, earth tones and gold. The symbols incorporated in these pieces convey positivity and remind viewers and the artist to stay focused on the spirit. Nicole is currently working on a series incorporating symbols to be used for the purpose of meditation. 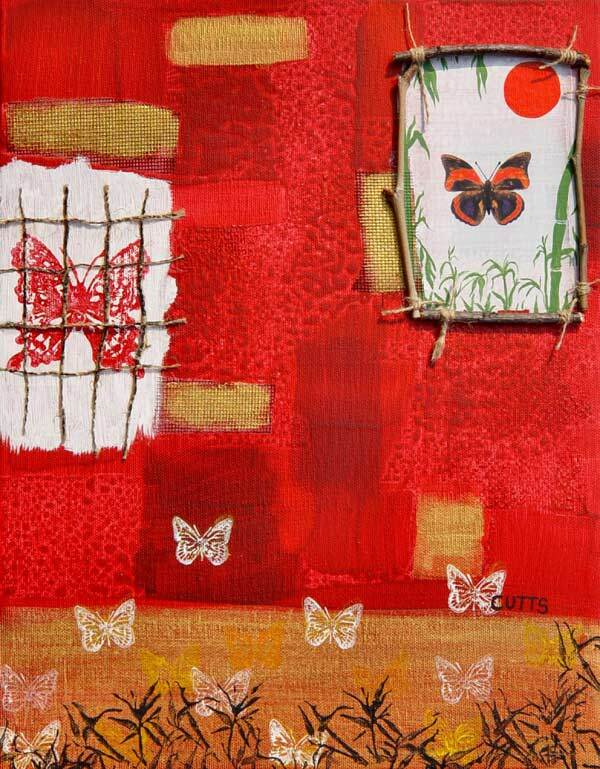 Some of her mixed media pieces also include elements of traditional collage technique. "Found objects" such as berries, bark, shells and feathers gathered on walks are captured on canvas, their natural beauty set off by rich color and texture. Nicole also paints landscapes that invite you into her magical world where sunlight and water abound. Her favorite subjects are seascapes; characterized by brilliant color and sharp detail, they represent the power of the ocean, the sun, and the moon. Nicole was born in Washington D.C. and raised in Maryland. As a youngster she enjoyed drawing, painting, and participating in local artistic competitions. She received her early training at the elbow of her uncle, George Rodney, a noted Jamaican painter. She later studied at the Corcoran School of Art, Howard University with Al Smith, and The American University-Rome. After college she moved to Los Angeles to obtain a doctorate in clinical psychology. Upon graduation she traveled to Morocco, Berlin and the western United States then “settled” back down in Maryland. In addition to teaching in the women’s studies department at The University of Maryland, Baltimore she resumed painting, sometimes taking excursions with her Rottweiler friend, Thurgood, out into the land along the Potomac River to paint the landscape. Today Nicole continues to travel and paint, forever in search of more beautiful horizons. When traveling to places like The Red Sea, off Egypt, Southern Africa, or the Caribbean, she writes and paints the landscapes there.